New Delhi: Ministers will meet this month to decide whether loss-making Air India should go ahead with a multi-billion dollar order for 27 Boeing Dreamliner 787 planes, a report on Wednesday said. The meeting, set for the second half of the month, comes as Boeing prepares to deliver the first Dreamliner plane to Air India after a delay of more than three years, Dow Jones Newswires reported. “The group of ministers will discuss whether it makes commercial sense for Air India to buy the Dreamliners or not," the unidentified senior aviation ministry official was quoted as saying. The panel, which is reviewing Air India’s financial turnaround plans, will decide whether to ask Air India to cancel or defer the delivery of the Dreamliners, the official told Dow Jones. The list price for each Dreamliner aircraft as of 2010 was $185.2 million, but airlines usually get a discount on this price. Boeing India president Dinesh Keskar told the news agency that the company had no comment on the report. Air India, which used to dominate India’s skies but now has a domestic market share of 17.4% amid fierce competition, from private carriers, wants to use the planes to expand its long-haul operations. Dow Jones quoted the official as saying the government wants to ensure that Air India has the financial capability to pay for the Dreamliner planes. The 27 Dreamliners are part of 111 planes ordered by Air India from Boeing and Airbus. Air India has been incurring massive losses due to falling passenger numbers and higher fuel costs. It was also hit by the large aircraft order. Apart from the Dreamliners and three other Boeing planes, Air India has taken delivery of all the other aircraft in the 111-plane order. 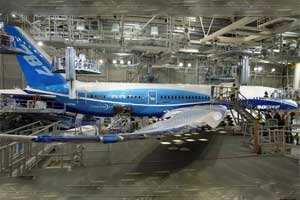 It is due to take delivery of the first seven Dreamliners between November and March. Air India reported pre-tax loss of ₹ 70 billion ($1.52 billion) in the last fiscal year to March 2011 and has accumulated debts of more than $7 billion. The airline is currently losing around ₹ $5 million a day. India’s auditor general has said the “risky" acquisition of 111 new jets was mistimed and imposed “an undue long-term financial burden on the carrier". Air India’s turnaround plan includes overhauling its network and restructuring debt.